WLS provides the option to monitor plug and play devices. 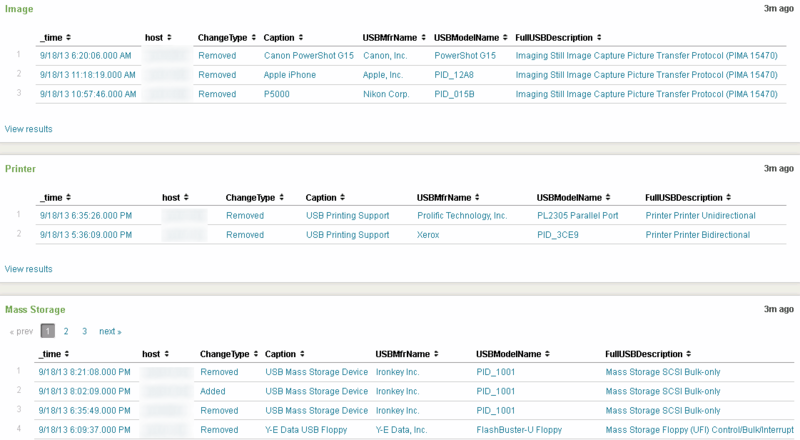 When enabled, a log will be generated for each state change containing the current state and detailed device information. 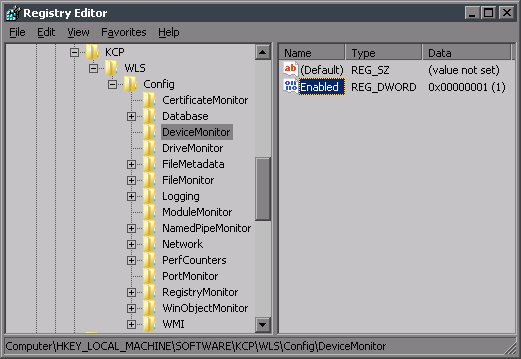 If WLS is already installed, device monitoring can be enabled by changing the registry value at HKLM\Software\KCP\WLS\Config\DeviceMonitor\Enabled from 0 to 1. If WLS hasn’t been installed, adding (or changing) the DeviceMonitor section and setting Enabled to 1 in the initial.xml will enable this feature when WLS is installed. Once device monitoring is enabled, when a device state changes, entries like the following will appear in your logs. Each entry should include at least one key/value pair that contains a product id (PID), a vendor id (VID), and a serial number as well as another key/value pair that contains the Class, SubClass, and Protocol. If the device fails to load properly, the Status field will be set to Error instead of OK.
Splunk is great for combining data from multiple sources, and in this case, data will be added to decode VID, PID, Class, SubClass, and Protocol. The best place (I’m aware of) to get VID and PID information is http://www.linux-usb.org/usb-ids.html. Download the usb.ids file, work some spreadsheet magic, and you have a nice csv file for a Splunk lookup table. Getting the Class, SubClass, and Protocol information isn’t quite as straightforward; I started here: http://www.usb.org/developers/defined_class and generated a csv file for another Splunk lookup table. Luckily these don’t change as often as VID and PID information. Add these csv files to Splunk by going to “Lookups” in the Splunk Manager page, then choosing “Add new” on the “Lookup table files” line. Both lookup tables are available to download at the end of this post. Now that lookup tables exist, the information to lookup needs to be extracted from the source logs. I created two macros, one to extract and lookup the hardware manufacturer and model, another to extract and lookup the class, subclass, and protocol. Both macros split a single field into parts, and lookup the individual parts. I assumed that a new PID may exist for an existing VID, and that the new PID may not be in the lookup table; so a double lookup is performed and the first non-null value is returned. With all the information combined, it’s time to make a dashboard. I created one that displays each class in it’s own titled section for readability. If the lookups are able to decode the VID, PID, SubClass, and Protocol, the decode is shown, otherwise the original undecoded value is shown. When deployed enterprise-wide, logs now exist to uniquely track any plug and play hardware across all systems and users. The PID, VID, and serial number can be used to identify new and potentially unwanted devices. Combined with a process to issue hardware from a central location, the issuer can register the device and the end-user. This reduces the noise and false positive alerts, and provides user accountability to a specific device. A word of caution, I have seen serial numbers reused, in mass. Here are the lookup tables I’m currently using, they may be out of date. They are renamed to .xls files so WordPress would let me upload them; rename to .csv after downloading. Have other ideas for using the data WLS provides, or data you’d like to have logged? Let me know in the comments below or via the contact form. This entry was posted in Splunk, WLS and tagged Class, device, lookup, PID, plug and play, Splunk, Subclass, USB, VID, WLS on September 19, 2013 by digirati82.